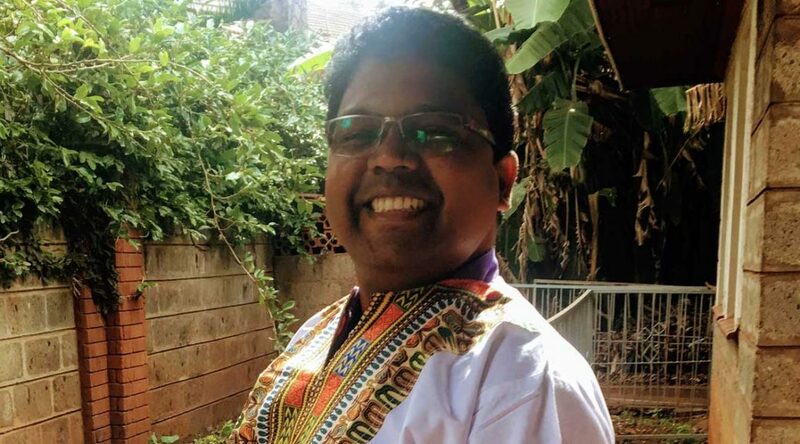 Vincent, an Unbound program coordinator in India, wears a shirt with traditional Kenyan prints that he received as a gift while visiting Nairobi. Vincent and Seema visit a tailor shop and learn about the livelihood of a family in Nairobi. Recently three of our program coordinators from India traveled to Kenya and Uganda to see how the Unbound program works in those countries. They had the opportunity to learn from their African coworkers and to experience the realities of families in Kenya and Uganda compared to India. This final reflection is from Vincent Murmu, the program coordinator for our Dumka office in India. It is indeed exciting to visit the Unbound family on another continent. I, along with Seema,the coordinator in Chennai, and Selvaraj, the coordinator in Bhagalpur, and under the able leadership of our project director Amanda Heter from Unbound Kansas, had the wonderful opportunity to visit two Unbound projects in East Africa – Nairobi, Kenya and Kampala,Uganda. It is like a dream come true landing on another continent. My eyes were fully opened with curiosity and excitement. The initial moments were full of admiration and discovery of the places, houses, people and the entire environment. Everything was different from what I was used to, but the warmth and family atmosphere were the same. We belong to the big family called Unbound. Hence we were not strangers to them, nor were they to us, even with all our differences. Everyone in the Nairobi team was very good and did everything possible to make us feel at home. Yes, we were at home there. We had an introductory meeting with the Unbound Nairobi Coordinating office team. It was wonderful to know the good works going on and that families are doing well under the leadership of Mr. Peter. It was an amazing team of youthful and vibrant leadership. The Nairobi team shared about the activities in their program and all of us in turn had the opportunity to share about how our programs work. It was a good learning process. We spent the day visiting various departments in the office and learning from the coordinators. We visited the correspondence department where we learned that all the beneficiaries write their letters in English. It makes it much easier and reduces the work of translation. Meeting the counselor, Mr. Samuel, was wonderful. Counseling is a very important department. Mr. Samuel is able to help the youth in trouble, console and convince them that life is beautiful and worth living. The Unbound SACCO is a new thing for me. The Program Coordinator, Peter Ndungo, told us that he learned about the concept of the support mothers groups (SMG) from India way back in 2006 when he visited the Hyderabad office. In Nairobi, it has developed and grown up to SACCO. It was great to know that SACCO is doing well and going to start a front office where it will operate just like a bank. Many more people could be part of the Unbound SACCO and reach out to non-sponsored families, too. We had the opportunity to meet the SACCO management team and the Credit committee. The concept and management of the Unbound SACCO was great. It has given lots of inspiration to me to make the families to own the program. The SACCO is a great example of this. Visiting families was wonderful. We had the opportunity to see family enterprises. Mothers, fighting with all their difficulties, try to do the best with the opportunities and resources they have. It was very inspiring to see their enterprises. We also had an opportunity to participate in a SMG (parent group) meeting. The subproject staffs and mothers are well informed about the program. They shared about their duties and various activities. Meeting the mothers was the most wonderful part of the visit. The process of SMG meetings is almost the same [as in India]. It is very helpful to share the ideas with them and to get their support to do all the work done. Mothers are always mothers in any part of the world. : Some of the gifts of crops that were given to Vincent and the other Indian coordinators by families in Uganda. The second part of our East Africa trip was to visit the Unbound Kampala project in Uganda. Ms. Teddy Naluwu, the program coordinator, warmly welcomed us at the Entebbe Airport. The next day was a great, as we met all the Unbound Kampala staff. We had a whole day session sharing our program activities in turns. The great thing I discovered was that the children in the Kampala project do not have individual [child bank accounts] like they do in Kenya. However, the benefits were well distributed to each individual. The program has well-structured parent groups. The groups had various committees, and there is also an umbrella team made up of the leaders of various groups. This umbrella team monitors the groups and their activities. Each individual beneficiary receives direct support for education, material support for the family and building materials to construct homes. The program is well organized by the able leadership of Teddy and her team. Kampala is a rural program, and the communities are very far from the main office in Kampala. It very much resembled the Dumka program in India with regard to facilities and challenges. The people could speak and read and write their own language. English is foreign to them. The poverty of the people could be easily seen. Their main occupation is agriculture. They grow bananas, beans and coffee. We were able to meet the teams in both local offices. We visited a group and participated in the meeting of St. Mary’s mothers group in Kabiga Village. Unbound staff is supporting the families by giving them training in livelihoods, especially to increase the coffee and banana crops. It has boosted the income of the families. We were able to visit several families in the area. They were so welcoming. The families would not let us go without eating or receiving something from the family. 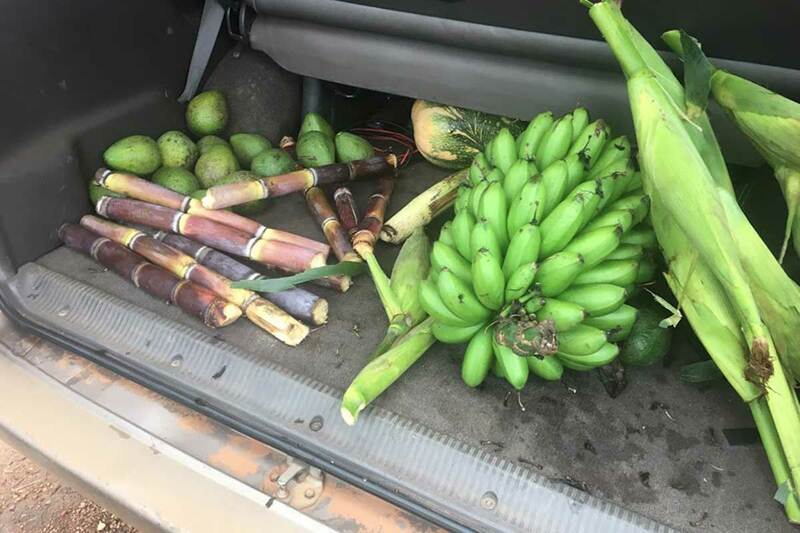 Our vehicle was full of gifts like bananas, avocado, sugarcane and more. We could see that each family was so grateful for the sponsorship they received. Hard work, unity and focus toward the goal of Unbound can be seen in the staff and mothers alike. The well informed, trained and committed staff and mothers are the pillars of Unbound’s success and sustainability. It was a very empowering opportunity for me to visit two projects of East Africa. The visit had an indelible impression on me and will guide me in planning the activities in the program I coordinate at home in India. I am grateful to the staff in Kansas. I really thank Ms. Amanda for accompanying us all through our visit to Nairobi and Kampala projects.